Although kombucha has been around for 2000 years or so, until recently it was a fridge staple in the local health food store or brewed by a few local health gurus. After making its Hollywood debut in the last decade, it seems that kombucha is now here to stay. Containing probiotics which can help improve digestive health and tea that has several health benefits, it can include other natural and raw ingredients which may also have some benefits for wellbeing. With so much kombucha now on the shelves, it can be difficult to know which one to choose. In this article we review some traditional kombucha and some of the best kombucha brands with a contemporary twist. We also look at the background of this popular drink, its potential health benefits and some of the concerns around its safety. So, whether new to kombucha or a regular drinker, we hope that when you read on, you will find some interesting new facts about this very old drink. The B-tea kombucha is our best pick as a traditional kombucha which is organic, probiotic and alcohol-free. The Wonder Drink kombucha traditional is our budget pick with its sweeter blend of three teas, organic flavors and juices. 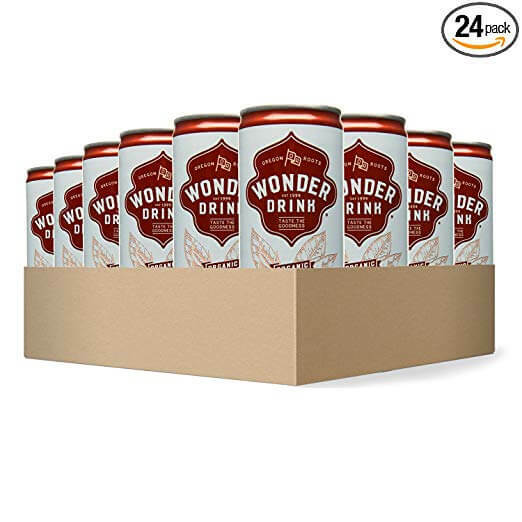 Made from premium organic black, green and oolong teas, the Wonder Drink kombucha traditional is fermented and blended with organic flavors and fruit juices. This non-alcoholic sparkling drink is certified USDA Organic, gluten free, vegan and non-GMO. 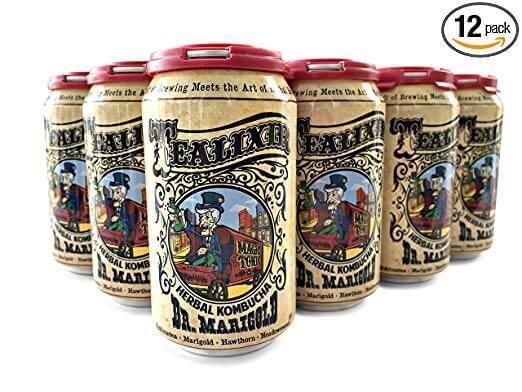 Offering a more modern twist to a traditional kombucha, it is available in a 24 pack of 8.4oz cans. As this is a pasteurized drink, it does not contain any probiotics unlike raw kombucha. This also has a sweeter taste and some drinkers may find it tastes better served over ice. The traditional B-tea kombucha is made with Darjeeling black tea leaves and is certified organic. It uses only raw and all-natural ingredients which are primary fermented for three weeks. It uses fresh SCOBY, or ‘symbiotic culture of bacteria and yeast’, in every fresh batch of kombucha made. SCOBY can sometimes develop in the bottles even though the drink is micro-filtrated before bottling and you may find an occasional clump at the bottom of the bottle which although completely harmless, you may find it slightly unpleasant to drink. This non-alcoholic kombucha comes in two sizes of bottle and the 8oz bottles come in a handy pack of 12. The plastic bottles are free from BPA and UV-protected. This kombucha does not need storing or serving cold and it is gluten free. The GetKombucha kombucha extract is certified USDA Organic Fairtrade and GMO-free. Made with an in-house formulated blend of organic whole tea leaves, it is free from any alcohol or sugar. 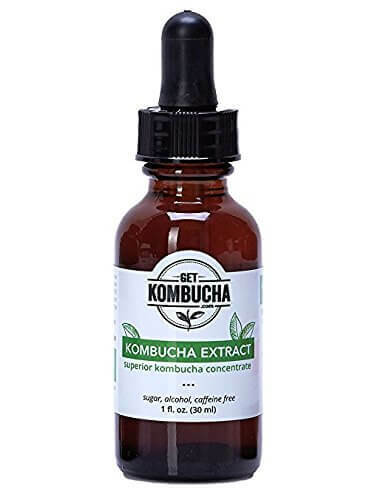 Unlike traditional kombucha, this extract does not contain caffeine. Suitable for gluten free or vegan diets, it comes in a dropper bottle that allows you to add varying amounts of the extract to iced tea, juice or water. You can even use it as a marinade or dressing. As it is an extract, and if you are not keen on the taste of kombucha, it does give you the option to dilute even further and hide its taste. Available in 12oz cans that are lined and free from BPA. The TEALIXIR herbal kombucha Dr. Marigold is made from Ceylon tea, echinacea, St. John’s Wort, ginkgo and hawthorn. It also contains an infusion of marigold, dandelion and other fruits, flowers and spices that may offer health benefits. Like the traditional kombucha drinks, it contains probiotics. A raw fermented drink with natural effervescence, GT’s hibiscus ginger kombucha is organically produced. Made with black tea, green tea, kiwi juice, hibiscus and ginger, it contains naturally occurring alcohol and is a probiotic drink. 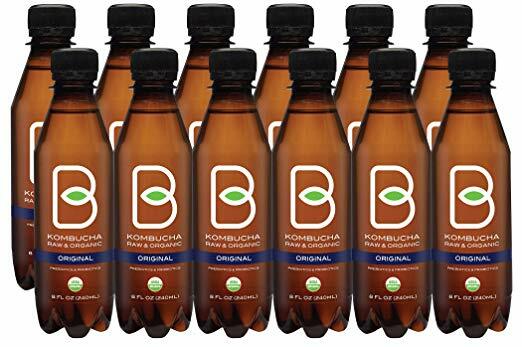 These 16oz glass bottles come in a pack of 12, and because this kombucha needs shipping and storing cold, its delivery costs will be higher than comparable products. The Health-Ade jalapeno-kiwi-cucumber kombucha is made from a blend of USDA certified organic ingredients, including black and green teas. This small batch kombucha is also non-GMO Project verified, certified gluten free, vegan and raw. This is a spicy flavored kombucha which may not be popular with all and shipping is currently limited to certain states as it needs cold shipping. Kombucha or ‘booch’ is a traditional drink that has been around for the last two millennia. It is a fermented tea with an acidic taste and a little sweetness. Originally brewed in China it spread to Japan and Russia and the name kombucha is thought to be from Japan; when a doctor treated an emperor called Kombu with the tea. As the Japanese word for tea is cha, the names were joined together to create kombucha. It is made with a probiotic culture often called SCOBY or ‘symbiotic culture of bacteria and yeast’ and it is these cultures that many suggest offer the real health benefits. If you are new to kombucha you may sometimes see the SCOBY settled on the bottom of the bottle. Although you may not fancy drinking these clumps, they are completely harmless as they are made up of the beneficial probiotics that were added to the drink during production. Black tea is the common tea in kombucha, but others contain green or oolong. Herbal teas or similar are not used as they do not support healthy SCOBY. When kombucha is made, tea is steeped and removed from the water and then sugar is dissolved into the brew. Once it cools, the SCOBY and a small amount of previously fermented kombucha, also known as a starter liquid, is added. The brew then ferments at room temperature for around seven to ten days and may be tasted and bottled then or allowed to ferment longer for the right flavor. Each batch of tea will usually have some minor nutritional differences due to the use of ‘live’ and raw ingredients. Kombucha is usually raw or unpasteurized to prevent damage to its probiotics and nutrients. Because of this, most need cold storing to prevent them from over fermenting. When kombucha ferments it also produces natural alcohol and its shelf life usually determines how long it can be cold stored before its ethanol level goes above prescribed legal limits. Kombucha has a low pH, but to make it safe to consume it cannot be any more acidic than 2.5 or more neutral than 4.2 on the pH scale. 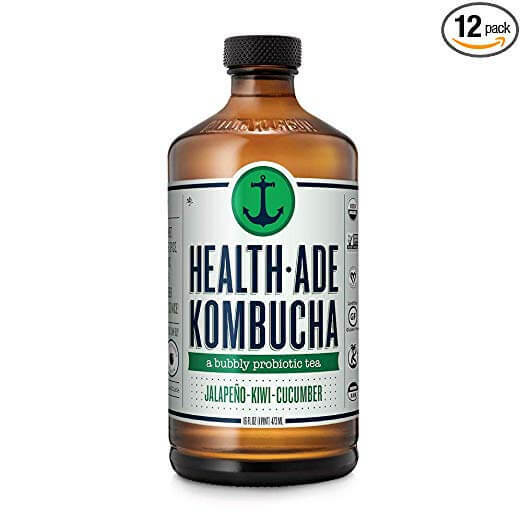 When the final pH is around 2.5, kombucha has antimicrobial activity against a broad spectrum of bacteria and yeasts, although this may not just be due to the pH; the polyphenols in the tea and other molecules may also act as antimicrobials. There are many claims made as to the health benefits of kombucha. To date, few have any scientific evidence supporting them, although some of the ingredients such as probiotics and tea have been shown to have some health benefits. Raw kombucha contains probiotics or live bacteria and yeasts. There are many types of probiotics, such as lactobacillus, which is also found in yogurt. Known as ‘good’ bacteria, probiotics can help maintain better gut health by balancing out ‘bad’ bacteria in the gut and increasing levels of good bacteria which are destroyed when you have taken antibiotics. Although there is still much research needed in this area, it is suggested that probiotics are helpful in cases of infectious diarrhea or diarrhea caused by antibiotics, irritable bowel syndrome (IBS) and inflammatory bowel disease (IBD). Some also suggest probiotics may help with some skin conditions, oral health and urinary health. The probable benefits of tea have been examined in detail by many scientists and quite a few studies show links between tea consumption and specific health conditions. Black tea contains polyphenols which are antioxidants. These remove molecules called free radicals in the body which cause damage to cells. Free radical damage is linked to major conditions such as cancer and diabetes. Polyphenols may also act as antimicrobials and inhibit the growth of bad bacteria in the body. Flavonoids are another group of antioxidants found in tea and these may help reduce factors for heart disease, such as high cholesterol, high blood pressure and higher triglyceride levels. Some groups advise against drinking kombucha due to a very low risk of contamination. However, as people do brew their own, it is more likely this which causes the higher risk of contamination, rather than commercially produced kombucha which is a specialized food process subject to federal controls. There are several good manufacturing processes or GMPs and standard operating procedures (SOPs) that the FDA suggests to manufacturers for safer kombucha production. The FDA also says that kombucha can be safe for human consumption when properly prepared and is safe to consume up to four ounces per day. If you have compromised immunity, are pregnant or have pre-existing health considerations then you should not consume kombucha. You should not allow young children to drink it either. Like any new food, start with a small amount taken with plenty of water and wait to see how your body reacts. You may have some temporary upset, such as bloating, gas or diarrhea, mainly because the balance of bacteria in your gut is altering due to the probiotics. There have been occasional cases of illness and a rare death reported, although these cases were associated with certain factors, including non-hygienic home production practices. The more common side effects reported from kombucha include nausea, vomiting, allergic reactions and jaundice, although it may be that these arise through excessive consumption of kombucha, or other pre-existing medical conditions. In this article we have looked at some of the reasons why ‘booch’ has become so popular. Although many of its health claims have yet to be confirmed, there are definite links between two key ingredients - tea and probiotics - and health benefits. There are occasional safety concerns with drinking kombucha, but these seem to be more often through poor home brewing rather than commercially available drinks which are subject to federal controls. 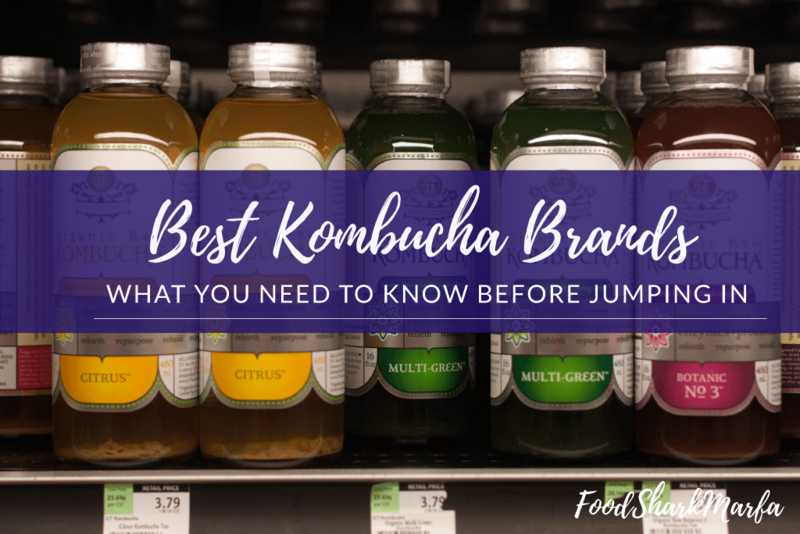 So, whether you want a traditional kombucha, or fancy something with a different flavor, we hope that our review of some of the best kombucha brands currently available has been helpful and supplied enough information for you to make your booch choice.